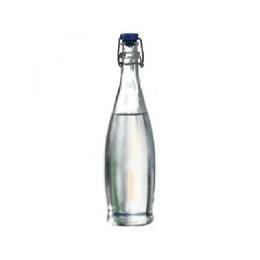 Set the new standard for style and sophistication with this Libbey 13150020 34 oz. water bottle with wire bail lid! 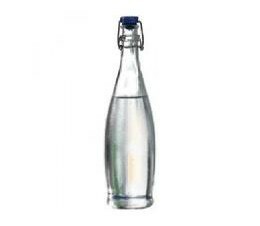 Made of crystal-clear glass, this bottle is great for serving water tableside at your restaurant, bar, hotel, or lounge. With a 34 oz. capacity, you can even leave the bottle on the table to allow your guests convenient access to refreshing water throughout their meal. The blue lid provides a tight seal to prevent spills, while also keeping your products fresh. Plus, the lid is attached by a wire bail, so there’s no risk of misplacing it!